As a company Markets Online spends a large proportion of its hours consulting to Small and Media Enterprise’s (SME’s). When evaluating a new clients’ online marketing strategy we are constantly faced with random mixes of online marketing assets – some that work and many that don’t. Faced with the task of rationalizing this mix, one is constantly met with the need to prioritise the businesses needs. If the business has a website, is it an adequate website? Does the website need attention? What is the state of the On-Page SEO? Is the content relevant to searches for the services the business offers? What is the state of the Off-Page SEO, or links and content coming into the website? It there a Google Adwords campaign in place? Have they ever used Google Adwords? And what about Social Media? Email Marketing – will it work with for the company? Faced with all these questions, we started to by default develop an online marketing hierarchy of needs for the SME. A standard set of practices we use to approach each of our clients’ unique set of needs and identify their position in the online marketing path to success. 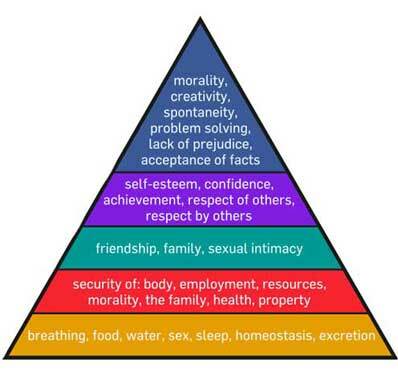 So some of you that might have done psychology or social sciences at university might already have spotted a familiar theme – The ‘Hierarchy of Needs’. Maslow’s Hierarchy of Needs is standard fare for all first year psychology and social science students. Abraham Maslow developed the Hierarchy of Needs as applied to the field of human psychology more than sixty years ago, and was first released in the paper ‘A Theory of Human Motivation’ (1943). Since then, the model has been applied to a wide variety of fields beyond the social sciences. The theory stipulated that the higher needs of humans become the focus only as the lower needs are consistently satisfied. Below is and image of his original 1943 Hierarchy of Needs. 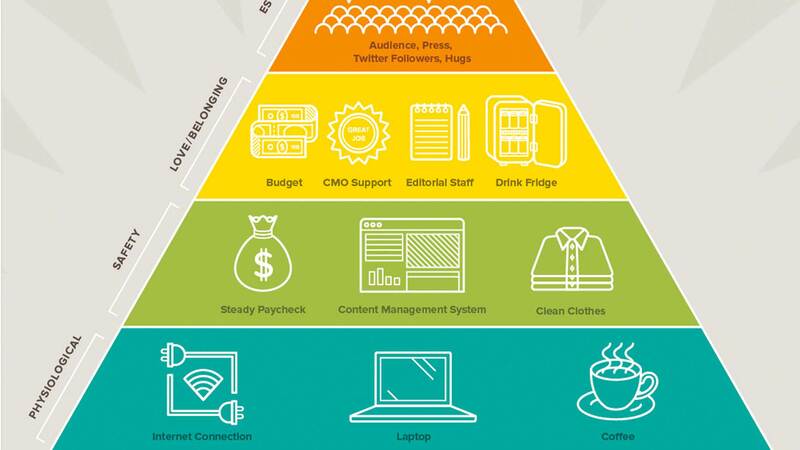 As businesses consider the progressive layers of Online Marketing tools at their disposal, we believe that to obtain the highest business value; a needs hierarchy similar to that developed by Maslow should be considered. As an online marketing organisation we get many calls from prospective clients that believe Social Media is going to be the answer to all their marketing requirements. However when we look closer at their current online marketing strategy, we often find that their website is in need of some attention – generally in the content and conversion optimisation areas. The Hierarchy of Needs urges us to address the website first. In Maslow’s Hierarchy of Needs, the lower levels of the pyramid have the greatest effect on the individual; in our adapted model the lower levels have the greatest effects on the business. Although not entirely true, as all levels work together – feeding off one another - there is a diminishing rate of return as one goes higher up the Hierarchy of Needs. For this reason it makes sense to focus very strongly on the lower levels of the pyramid until the elements that constitute the layers are strong and yield measurable results. The easy wins are in the lower levels. The diagram above is by no means a comprehensive list of elements that constitute the layers. It is however important to note that although the attention is not focused on the higher levels in the beginning stages, it is very advisable to set up the building blocks of the higher levels while the focus is on the lower levels. A great example of this is to set up your company Facebook, Google Business and LinkedIn accounts even though the marketing plan does not plan to actively develop and work them for some time while the lower levels are built. Linking up the Social Media accounts to pull updates from the businesses website is a very easy process to complete. A new page or news item is pushed through to the Social Media assets and builds some history and generally a following on the account with very little effort – priming the accounts for the day the business decides to actively focus on these assets. 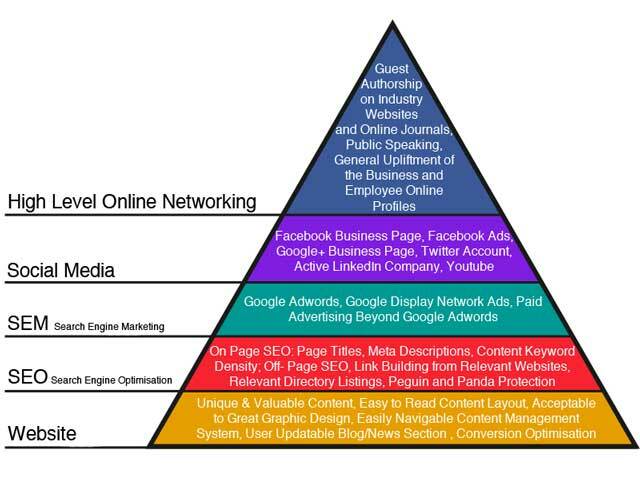 The Online Marketing Hierarchy of Needs can be used as a framework for online marketers when discussing, evaluating and implementing strategy, prioritization, and funding of online marketing initiatives with their colleagues and suppliers. It may help them more readily explain the importance of meeting and attending to the basic online marketing needs. It very importantly also keeps an eye on the more sophisticated or innovative online marketing techniques (higher levels) that may provide competitive advantage.